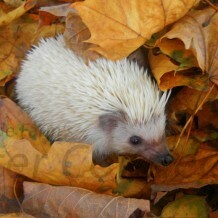 A few owners have used hay as a nesting option for their hedgehogs. As long as the hay is from packaged from a pet store it should be fine. Hay used for large livestock hasn’t been treated for anything that could make your hedgehog sick. As long as the igloo or sleeping area remains clean it is a comfortable, natural bedding. Hay is generally NOT recommended as the main cage bedding. All bedding should be properly cleaned and processed to remove the risk of mites and other parasites.